1. Don’t be a whiner. Nobody likes a whiner, not even other whiners. 2. Walking out the door is often the toughest part of a run. 3. Don’t make running your life. Make it part of your life. 10. All runners are equal, some are just faster than others. 14. When standing in starting lines, remind yourself how fortunate you are to be there. 15. Getting out of shape is much easier than getting into shape. 21. Approach running as if the quality of your life depended on it. 22. No matter how slow you run it is still faster than someone sitting on a couch. 30. There is nothing boring about running. There are, however, boring people who run. 33. Never throw away the instructions to your running watch. 34. Don’t try to outrun dogs. 35. Don’t trust runners who show up at races claiming to be tired, out of share, or not feeling well. 38. Never run alongside very old or very young racers. They get all of the applause. 46. Unless you make your living as a runner, don’t take running too seriously. 48. 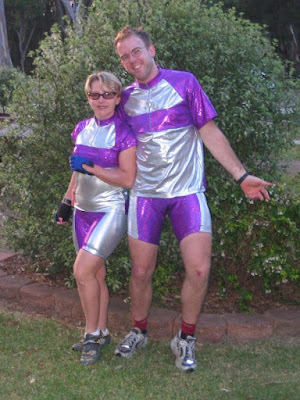 Never tell a runner that he or she doesn’t look good in tights. 49. Never confuse the Ben-Gay tube with the toothpaste tube. 50. Never apologize for doing the best you can. 52. Running is simple. Don’t make it complicated. 53. Running is always enjoyable. Sometimes, though, the joy doesn’t come until the end of the run. And with that . . . Tony and I ran 8 miles today. Eight. EIGHT freakin miles. That's the most I've ever, ever, ever run in my life. I estimated that we could finish in 90 minutes. After the first mile though, I was dying. I initiated a run/walk approach. I hear it's all the rage with marathoners . . . and felt pretty stupid doing it for 8 miles, but after every mile we walked a minute, counted in my head . . . which means some minutes were verrrry long minutes. I absolutely thought we sucked, and by we, I mean me. And as we rounded the bend to finish, I was trying to prepare myself for how bad our time was . . . all for no reason!!! 80:00 minutes, exactly. We ran 8 miles in an hour and 20 minutes, on our same 10:00 mile pace! I love that. Number two pretty much sums it all up for me! You are absolutely incredible! Way to go. I absolutely love paying down/off debt! What a weekend . . . Which do you guys prefer?